People inside the smartphone space have been excited about Palm’s webOS and the Palm Pre. To cap off CES, Palm was awarded three coveted CNET Best of CES Awards. The Best of CES Awards represent the "cream of the crop" and there are thousands of products who strive to win these awards. Palm won three awards, the most notable being "Best in Show Award", given to the company whose product is the best overall product at the show. They leave CES with Best Cellphone/Smartphone and the People’s Voice award, decided by over 10,000 CNET readers. The webOS is a revolutionary OS and the Palm Pre is a shining example of a how software and hardware should work together seamlessly. Stay tuned for ongoing Palm Pre coverage. Palm has posted the complete presentation of the Palm Pre event at CES 2009. The Pre announcement was a great event and worth watching to hear the story behind the new management team, webOS and the Palm Pre. Peter Skillman, VP of Industrial Design for Palm, walks through the elements of hardware design on the Palm Pre. From the hardware to the packaging, Palm’s mantra with the Pre was "no detail is too small". Speaking of the packaging, the Palm Pre packaging is similar to the Treo Pro. Like the Palm Pre, it’s small and it’s "green". Skillman also demos the Touchstone accessory that allows you to charge the Palm Pre without having to plug it in. Simply drop the Palm Pre on the Touchstone and it starts charging. In the third installment of our Palm Pre hands on video, you’ll see a demonstration of how the Palm Pre handles notifications. Rather than interrupt your current workflow, the Palm Pre alerts you at the bottom of the screen. You can choose to dismiss, snooze or act on the notification. This is a great example of "cards" and how the Pre allows you to work between applications on the Pre desktop. This is the closest we’ve seen of desktop productivity on a mobile device. As a side note, I owe a thank you to the Palm staff who were tremendously gracious when it came to providing demos and answering a million questions regarding the new webOS platform and the Pre. Just a few hours from our live blog coverage of Palm’s CES Event. Will they bring the new-ness? Some have dubbed this event make or break for Palm. I’ve traveled 15 hours (if include layovers and check-in) and ready to head over to the Venetian Hotel to provide blow-by-blow coverage. Watch it unfold on our live blog event at everythingtreo.com/live. Coverage will begin on or around 2:00 p.m. EST. As covered earlier today, we now know that Palm will use the CES Event to launch a new prosumer series of phones that will run the Nova OS. Is there still room for Palm at the smartphone table? Some are calling the new operating sytem”amazing”, but will it be enough to win back customers who have shifted to RIM’s BlackBerry or the iPhone 3G. Expectations are high and Palm has done plenty to help build the anticipation. This product announcement is unlike most Palm’s recent history, with zero leaks prior to launch. Even more impressive is the fact we’re talking about both an OS and hardware. No screenshots, no blurrycam photos to be found anywhere. The new Palm phone has been in the hands of carriers, yet all we have to go on is Crunchgear’s source who says the new form factor is a top-down slider with a touchscreen display. Details regarding Palm’s new smartphone are starting to emerge in advance of Thursday’s Palm event at CES. Crunchgear is reporting that the latest Palm smartphone running the Nova operating system will in fact debut on Thursday. The new phone will feature a full QWERTY keyboard that slides down from a portrait touchscreen. The mockup (courtesy of Crunchgear) is their rendition of what sources have told them. Sources say the new OS is "amazing" and the phone is being described as "iPhone-like". EverythingTreo will be live blogging the event on Thursday at 2:00 p.m EST at everythingtreo.com/live You can sign up for a reminder below. Just under a week away from one of the biggest event’s in Palm history and EverythingTreo.com will be there to provide you with live coverage. The Palm "New-ness" event is expected to usher in the new Palm OS and a new family of smartphones. To get the news first, visit everythingtreo.com/live on January 8th at 2:00pm EST. We’ll be live blogging the event providing you with coverage as it happens. If you have questions for Palm, submit them in the live blog comments section and we’ll do our best to get all the information related to the new Palm products. With this new announcement, we expect our forums will be filled with discussion related to the event. 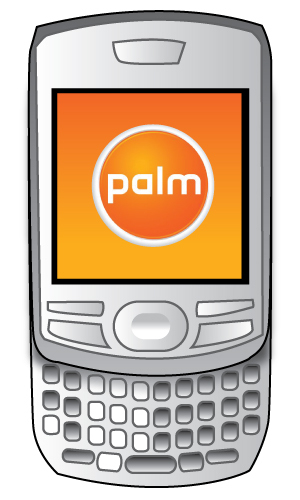 We’ve set up a special Palm Event forum for discussion. Not a member? Register today in advance of Thursday, so you can take part in the discussion. Everything Treo will be providing live coverage of Palm’s event on January 8th at 11:00 PST.